We did it! Together in solidarity, we have all accomplished a fantastic goal. For the first time we have passed the 100,000kg mark of food distribution within a year – in 2018. This amount will continue to increase and we look forward to seeing Albanian government law changes which would increase the amount of food given to poor families in need, and as well to social soup kitchens. A BIG thank you to every volunteer, corporation, business, organization, school and to every person who helped contribute to this good cause. Together we fight poverty in Albania, step by step. 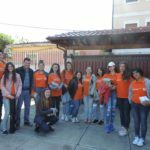 – Schools’ project: Education, awareness and food drives totaling almost 10 full tonnes of food raised from schools in Tirana. We are glad we are able to equip our youth with quality and updated material regarding food waste and ways to prevent it. – Special events: Red Cross project cooperation for our golf game fundraising project and a separately organized Christmas Bazaar fundraiser which together provided over 1400 meals for families in need. 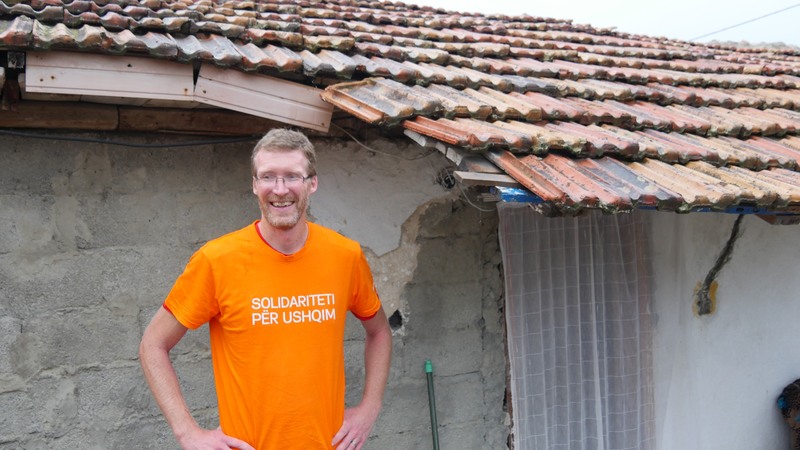 – NGO’s: All this could not happen without the sacrificial support of over 40 NGO’s throughout Albania. Thank you all! With that said, poverty and food waste are still major issues in Albania. Almost a quarter of the population are close to or below the poverty line and may not know where their next meals for the month will come from due to financial constraints. All recipients FBA helps are in need and constantly need your help, volunteering and connections to turn this country around. Please help us overcome these obstacles and change the country one step at a time. For more information on volunteering, read and send us the volunteer application. If you are an NGO or Business, you can read about partnering with us and send an application. Contact us at info@foodbank.al for more information. 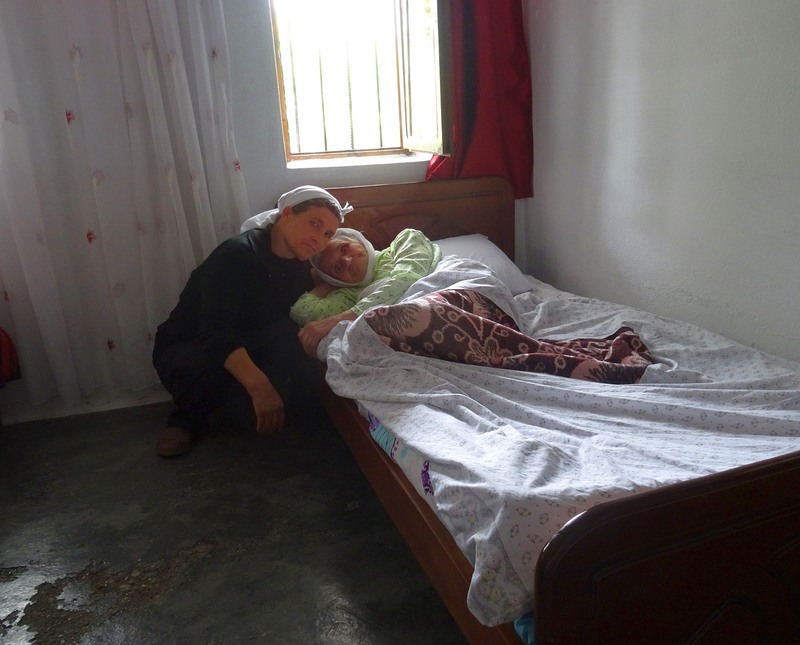 May 2019 be a year of blessing to you, and a year of plenty for the poor in Albania. Why do we need a Food Bank? What makes a food bank different from other organisations? After all, all non-profits serve a worthy cause to follow and support. All non-profits work hard for positive change and so why is the food bank different? Well, based on its social mission and humanitarian efforts, it is not that different. A food bank is just another non-profit that works hard to care for people and the planet. But on the other hand, a central food bank is a vital organization in mostly every country. Food banks allow for the collection and distribution of all donated food across the country. Food banks require massive energy to reach their purposes. You see, the amount of money invested, the number of volunteers committed, with professionals serving through their skills and passion, is a must for the food bank to thrive. In countries with relatively new food bank operations, only after a commitment from many contributors, the society can see the difference that a food bank makes. It is like a new automotive company that works for years before the first prototype is made. Let us talk in figures why we need the food bank, and the immediate results of commitment and problems that Food Bank Albania faces in its mission. A good accountant could save hundreds of dollars in fines, which could put a huge dent in a small NGO’s social reach. A legal advisor could help us pave the path to needed law changes which will greatly increase the amount of donated food we can receive. A driver could help us add 3 additional supermarket points during food drive collections, equaling to several hundred more kilograms of food raised in a single weekend. A translator expands our educational outreach, informing the young generation on the severe effects of food waste, encouraging them to fight for social causes, as well as helping with important documentation. What is the level of food waste in Albania? No studies have ever been undertaken on the specific issue. Based on different studies, the food bank estimates that if we work together and reduce food waste even only 20 % of what it currently is, Albania should be able to feed about 117.000 people. The World Bank estimates that only one third of the poorest 75.000 families in Albania are helped financially from the state. These 75.000 families make 10 % of the whole population. How many elderly live below the poverty line? How many children live under the poverty line? What IS the legal accepted poverty line in Albania? Since half of the population is directly connected with the village, what are ways that can boost the rural population’s earnings? Charity work is not that simple after all. We need the figures in order to make our cause known and seen, in order to speak on behalf of those that have no strength of voice in society. We are glad to inform you that the Fresh Food Project has been a success. It was started in the end of last year and we have received several thousand kilograms of quality food. Throughout this project, we are able to recover food from going to waste every week. Our volunteers working at the main fresh food market collect food donated from the merchants and then quickly distribute it to up to 10 soup kitchens within the day, half of them in Tirana where the majority of the population lives. 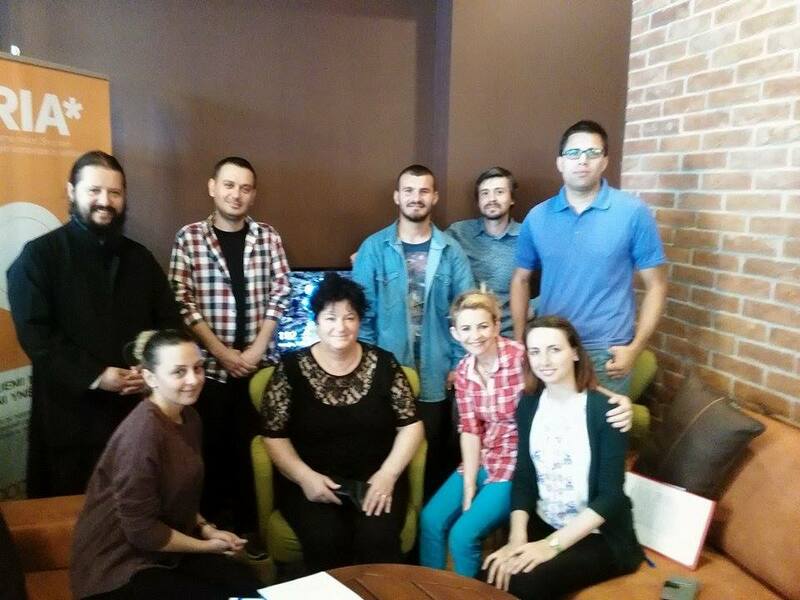 The project is active in Tirana and Elbasan and will soon extend into other cities as well. We are glad to see many merchants donate food to the poor. All people have the right to eat healthily and the soup kitchens are the perfect solution for a quick and healthy meal. We are also happy to announce that our Seeds Project this year won the first prize for INNOVATION at the European Food Banks’ Federation, FEBA. This project consists of supporting needy farmers with quality seeds that the farmers can use in their land. Many farmers need quality seeds as well as tools to work the land. Sometimes, the food bank cannot easily take a food aid parcel to a family living in a remote rural area. So, we have initiated this project in order to take good quality seeds to the farmers which can support them during the entire year with fresh food produce. One parcel of food is more than enough for a family, and just in the last year, the food bank distributed 500 parcels of seeds. This project is not just giving out food to the poor; it gives a sense of dignity and ownership, since the farmer works on his own land, raising his own food. Our food supply has grown each year, and the network has now been enlarged with additional state institutions receiving food from the food bank. But our donor businesses are still not able to receive any tax credit for their food supplies to us. The paradox is that on one hand our country has lots of good food that is thrown away and on the other hand we have people in need that cannot access that food. It is easier for companies to throw out surpluses then to donate it to the food bank. This is a big minus to our work. The cost is social, economic and environmental. Our recent meeting with high officials at the ministry of Finances and Economy only led to another request for more information and at the same time asked for additionally working with the Ministry of Agriculture. We will not be dismayed, but we can’t wait to see an ending to our challenge. As the new school year starts, we are more than ready to keep going in our projects. The food bank moved to a new office in June. It offers more storage as well as more meeting space. We have recently purchased a minivan that will serve the needs of the fresh food project and have also prepared well upcoming fall projects in supermarkets and businesses. As we speak, a special fundraising campaign is being organised in cooperation with the Red Cross of Albania; an event that will include main restaurants and hotels in Tirana. 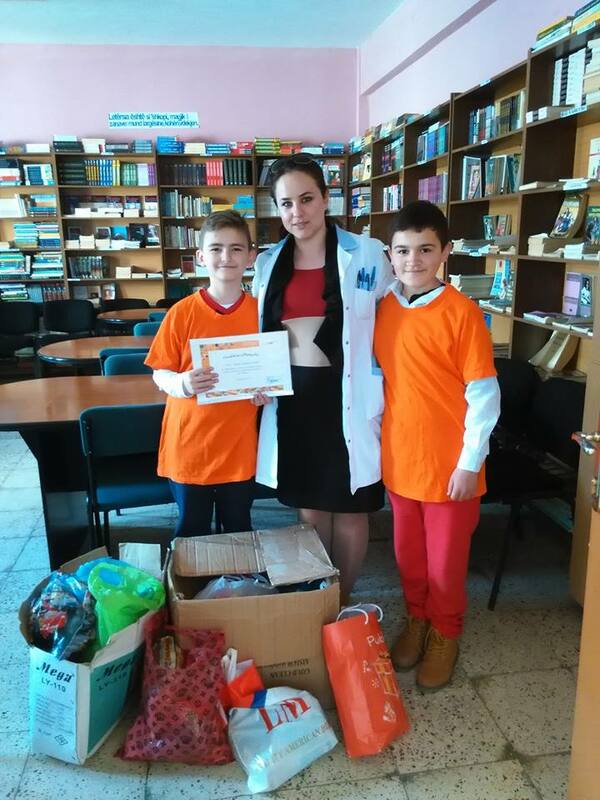 1 Based on 2016 total food raised of 30450 kg and 2017 total food raised of 26451.5 kg just within Albania with 2 staff and 2 full-time volunteers. The total amount of food raised (excluding importing from outside sources) in an average six-month period based on these last 2 years statistics is 14225 kg, therefore on average 3556kg per full-time staff/volunteer. 2 15 people at 3 meals a day for one month equals 1350 meals. One meal is equivalent to 0.4kg of food. Based on statistic above, a full-time volunteer raises just over 590kg of food a month, equivalent to 1422 meals, just over the amount needed to feed 15 people every meal for the entire month. 3 Based on rate of 1000 ALL per hour for professional services, equal to about 17000 ALL per month of expenses. 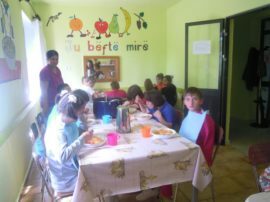 The cost for 1 meal is 0.5 Euro or about 62 ALL, therefore about 270 meals purchased from 17000 ALL. 4 Based on a 30-day month and a family of 4 with two young children which consume the same amount of food as one adult. Therefore 3 adult meals a day would be needed for a total of 90 meals in the entire month, at a cost of 0.5 Euro per meal equals to about 45 Euro total. 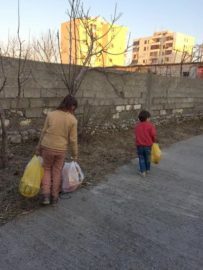 During the last year, Food Bank Albania has been working hard to find and distribute food for the poor as well as teach youth how important it is not to waste. We continue to reach more areas around the country; but, at the same time, we struggle to acquire enough food to meet the demand of the organisations we support. We often see a direct link between poverty and other social problems. This can be a result of the place where you live, the family you come from and a perceived lack of opportunities. We hear countless stories from people in need. People seek hope and someone to reach out to. 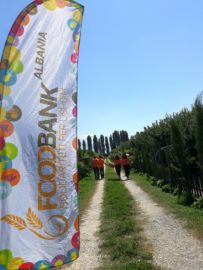 Food Bank Albania is an organisation that collaborates with non-government organizations (NGO) throughout Albania. Food Bank Albania supplies food to the NGOs, then NGOs distribute the food to those in need. This distribution model has proved successful. We focus on our relationship with food suppliers and NGOs and rely on our distribution partners to assist the people in their community. NGOs know the people in their communities well; they know who needs food the most and other forms of assistance. The Food Bank, through the NGOs, supports families for several consecutive months at a time in an effort to appease their dilemma as they overcome their challenges. Our projects have allowed us to distribute about 70 tons of food during 2017. We are thankful to all volunteers and donors for their support and work. We would like to thank our distribution partners as well as they are the ones who do the final leg work; meeting and helping people in need. We hope that 2018 will be an even better year for our organisation and for our country. And for that, your help is also much appreciated. It actually is very needed. Can you support us during this year as we support those who cannot speak for themselves? Whether being a volunteer or spreading the word, a small donation of food or a connection with a business, school or an organisations, these are all ways to contribute. Let us do this together! 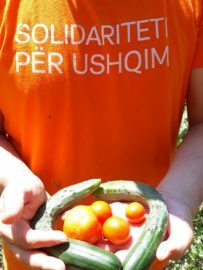 Solidarity for food! Dear friends, we are happy to bring you the latest news from the Food Bank. 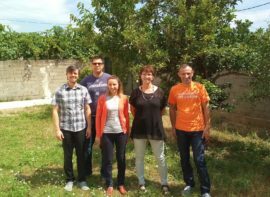 Read the updates below on our work to fight food waste and hunger in Albania. First of all, we have been able to reach many more businesses this year by our online campaign. We have had more donations and have made more friends than ever before. Also, more food is being distributed to soup kitchens, allowing us to feed many children and adults. It is good to provide basic food such as rice or pasta. However, eating the same food product almost every day may not allow the correct nutritional balance for everyone. This is why we decided to provide the funding for nutritious food for one of these soup kitchens which feeds about 150 children every week. This food will have all the calories that a child needs to thrive every day. We have also reached agreements with two other NGOs focusing on women in need, such as lone mothers, orphan mothers and women in risk of trafficking. As we continue our selection process of applicant NGOs, we feel the Food Bank can reach even further, to those who are in need the most in Albania. We understand that poverty is everywhere but our goal is to provide for the poorest, those who have less hope and are in remote areas. On the other hand, we have had a few setbacks too. Despite our continuous efforts for passing changes in the taxes regime for donations, it hasn’t happened yet. The recent changes in the Albanian government and the last month’s elections have made it impossible for the law to be implemented as of yet. We are blessed with our partners, the Embassy of the Netherlands and Pricewaterhouse Coopers who are helping us by drafting and submitting the changes required and providing the right connections and meetings. We remain very hopeful that in Autumn we will see a breakthrough in these efforts. Our first, and so far, most important project, the schools’ project is being redesigned now to include other teaching material, food preserving techniques, and more visuals. We believe that the fight against food waste can be won by education first and foremost. We have see that more than 90% of school children are not taught about the environmental aspect of food waste and how easy it is to avoid it. This is why we are stepping up in our focus this year to reach more students than ever before. We said goodbye to Adrian, our U.S. Peace Corps volunteer who tirelessly worked with us during the past year and a half. At the same time, we have been able to improve our cooperation with U.S. Peace Corps during this time, who have supported us by increasing our capacity as well as in our efforts to be represented in other cities of Albania where we currently don’t have activity yet. If you are one of our volunteers, we would like to thank you for your commitment and energy. Even only 4 hours of your time equals to about 30 kg of food collection, enough food for a small family for a week. Thank you for being part of our journey. Finally, please make sure you subscribe at our webpage to get our newsletter. During the course of 2016, the food bank worked to expand its reach by continuing programs that were successful in 2015. The most exciting news from 2016 is that the food bank has dramatically increased the amount of food raised. In 2016, the food bank raised over 57 tons of food; tripling the total from 2015. 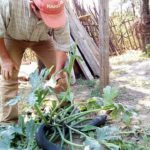 In addition, 30 tons of food were raised locally in Albania compared to just over 13 tons in 2015. Working with our soup kitchen partners, the food bank has contributed over 6,000 meals and in collaboration with many different agencies has assisted with the response to three different emergencies. All of these are encouraging trends that we hope to continue into 2017! The Schools’ Project visited 70 schools in 2016 and reached an estimated 30,000 students. Student food drives account for a significant portion of the food raised in Albania and visiting more schools definitely helps fill the warehouse. 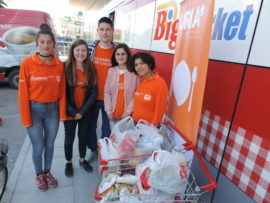 In addition, students who are aware of the issues of poverty and hunger in Albania make great volunteers and our supermarket food drives benefit from the enthusiasm and passion of these students. In conjunction with our international partners, the food bank has continued working on both the seeds project and the winter project. With the Seeds Project, the food bank has distributed 500 packets of seeds that enable families living in remote rural areas that are difficult to serve to grow their own produce. During December, January, February and March, the expanded Winter Project will provide food for 375 families across Albania. These programs make a huge difference in the lives of our beneficiaries and dramatically expand the reach of the food bank. None of this work would have been possible without the time and effort of our volunteers. This year 280 volunteers gave their time to help with food bank projects, more than double the number of volunteers who contributed in 2015. One of the highlights of 2016 has been working with Chris Brent to raise awareness about the food bank. Chris is a magician who has been living in Kosovo and Albania for the last 8 years. He is passionate about fighting hunger and has agreed to donate his time by working as an ambassador for the food bank. 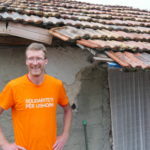 Chris has done shows at local schools, visited Korça to do a show for the food bank, and made videos to use on our Food Bank Albania Youtube Channel. Check out our videos page to see how Chris is supporting us – you can learn a few tricks while there too! Also, check out our Food Bank Albania Facebook Page to stay up to date with all our progress. Here is the message from the Board of Directors to all the people involved in making our work successful: “This particular time-frame still faces large groups of people struggling with poverty and lack of food, while at the same time there is more and more food wasted and thrown away. You can be involved too. You can donate a package for the people in need or visit our webpage where you will find the list of food items that you can donate, as well as other ways you can support us. 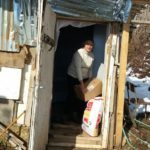 Vera ka qenë e ngarkuar për Food Bank Albania. Gjatë dimrit që shkoi, ne filluam një projekt me fara zarzavatesh. U shpërndamë fara cilësore perimesh familjeve në nevojë me qëllim që ato të mund të siguronin ushqim të freskët dhe me vlera për familjet e tyre. Pothuajse 300 familje nga Korça, Elbasani dhe Shkodra morën farat dhe mbollën gjatë verës. Ne pritëm me padurim se si do të shkonte ky projekt dhe tani që sezoni i pjekjes ka ardhur, më në fund po fillojmë të shohim rezultate. Jemi të lumtur të shohim që projekti ka qenë i suksesshëm; familjet sapo po fillojnë të korrin të mbjellat e perimeve të gëzuara për ushqimin shtesë në tavolinë. Një pjesë e farave janë pjekur tashmë dhe një pjesë do të jenë gati gjatë vjeshtës. Në Qershor, ne bashkëpunuam me Qendrën Rinore të Tiranës për të implementuar një fushatë ushqimore në disa pika EcoMarket në Tiranë. Me ndihmën e vullnetarëve tanë qemë në gjendje të mbledhim 487 kg ushqim. Edhe gjatë muajve të verës ka familje që nuk i plotësojnë nevojat ushqimore dhe dhuratat bujare të blerësve bënë të mundur që ne të ndihmojmë 20 familje me një pako bazë si dhe të sigurojmë disa pako urgjente për më shumë familje të tjera. Gjatë kësaj kohe kemi punuar për të përmirësuar programin tonë me shkollat lokale. Ashtu si në vitet e kaluara, ne po planifikojmë të vizitojmë shkolla nëpër Tiranë dhe të nxisim nxënësit të na ndihmojnë me fushatat e grumbullimit të ushqimit. Këtë vit, me qëllimin për ta bërë më përfshirës për studentët, ne po bashkëpunojmë me magjistarin Kris Brent! Krisi është mbështetës i Bankës së Ushqimit dhe ka ofruar të bëjë prezantime në disa prej shkollave që do të vizitojmë. Ai po sjell talentin e tij të iluzionistit edhe në faqen tonë në Facebook! Mos harroni të ndiqni videon e tij në faqen tonë për të mësuar se si kontributi juaj mund ta ndihmojë Bankën e Ushqimit (si dhe për të parë lugë që dalin në ajër nga hiçi). Krisi po ndihmon edhe me disa mësime numrash shpejtësie me qëllim që studentët të mësojnë të bëjnë truket e tyre gjithashtu. Kontrolloni shpesh faqen tonë në Facebook për këto mësime e të tjera lajme! Nëse do të donit të përfshiheshit në punën tonë, lutemi të konsideroni të dhuroni ushqim ose para. Puna jonë ndodh për shkak të zemërgjerësisë së komunitetit. Ne vazhdimisht kërkojmë për partnerë nga biznesi dhe nga komuniteti në luftën kundër urisë. Lutemi na kontaktoni nëse doni të organizoni një mbledhje ushqimore në zyrën tuaj ose të kontribuoni tek Banka e Ushqimit! “Unë jam Entela. Familja ime përbëhet nga 6 anëtarë; unë, burri dhe 4 fëmijët, më i madhi është 12 vjeç dhe më i vogli 5 vjeç. Ne jetojmë në një dhomë me kushte shumë të vështira. Ne jemi pa punë; burri im del çdo ditë dhe mbledh kanaçe dhe bidona në kazanat e plehrave që të mund të kemi të paktën bukë për fëmijët tanë. Ndonjëherë i pi alkol dhe ato që ka fituar i shpenzon për vete dhe për ne nuk mbetet asgjë. Shpesh, unë dhe fëmijët kemi fjetur me barkun bosh; kur ngriheshin në mëngjes fëmijët ndiheshin keq dhe ishin të uritur dhe nuk mund të shkonin në shkollë dhe në kopësht. Prisnim ditën tjetër çfarë mund të na sillte babi, çfarë mund të na jepte kisha ose të tjerët. 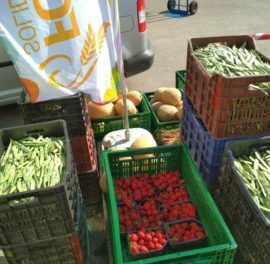 Summer has been busy for Food Bank Albania. Over the winter, we began a seeds project. We distributed quality vegetable seeds to needy families so they could grow their own crops and provide nutritious and fresh food for their families. Almost 300 families from Korçe, Elbasan and Shkoder received the seeds and planted their crops during the spring. We’ve been anxiously waiting to see what would happen with this project and now that the growing season is here, we are finally starting to see the results. 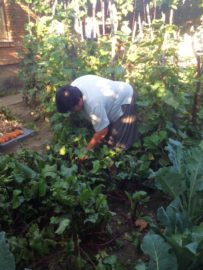 We are happy to report that the project has been successful; families are just starting to harvest their vegetables and everyone is happy to have additional food on the table. Some of the vegetables are ripe and some others will be ready during autumn. 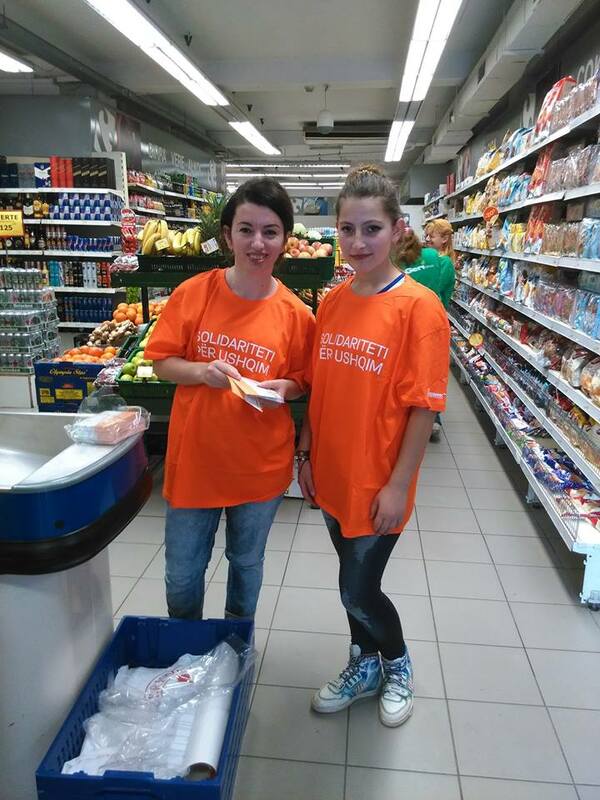 In June, we collaborated with the Tirana Youth Center to conduct a food drive at several EcoMarket stores in Tirana. With the help of our volunteers we were able to collect 487 kilograms of food. Even during the summer months, there are families that struggle to get enough food and the generous donations of shoppers made it possible for us to help 20 families with a basic parcel as well as provide some emergency parcels to more other families. We’ve also been working to improve our program with local schools. 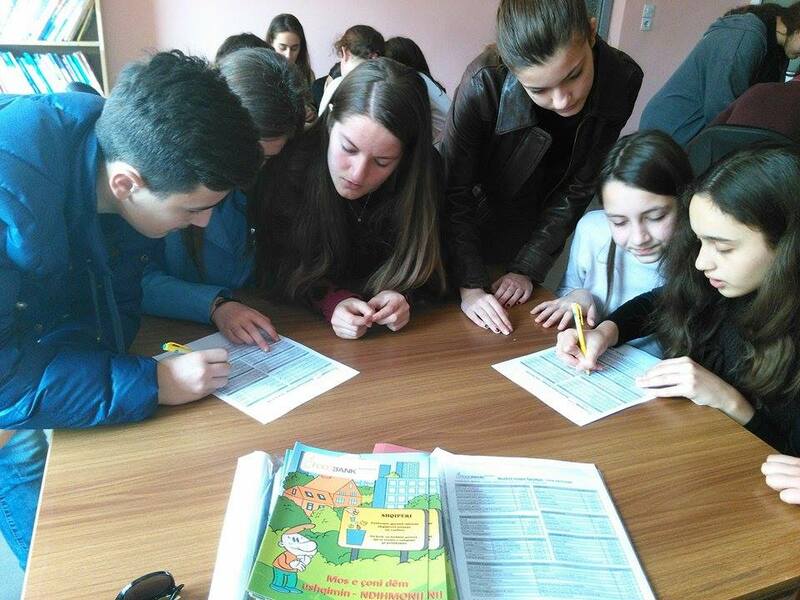 As in past years, we plan to visit schools across Tirana and encourage students to help us with food drives. 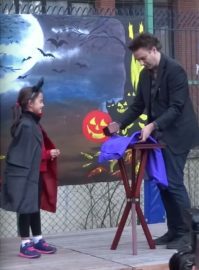 This year, to make the project more engaging for students, we are partnering with the magician Chris Brent! Chris is food bank supporter and has offered to do presentations at several of the schools that we will visit. He is also bringing his magical talents to our Facebook page! Be sure to check out his video on our page to learn how your contribution can help the food bank (and to see spoons appear out of thin air). Chris is also helping with some magic tutorials so students can learn their own magic tricks. Keep checking our Facebook page for these tutorials and more! If you would like to get involved, please consider donating food or money to the Food Bank. Our work is only possible because of the generosity of the community. We are always looking for business and community partners in the fight against hunger. Please contact us if you would like to organise a food drive at your office or contribute to the food bank! “My name is Entela. My husband and I have four children, between 5 and 12 years old. We live in a single room in very difficult conditions. We do not have jobs. Every day my husband collects cans and bottles from the trash to recycle so we can at least afford bread for our children. Sometimes he uses the money he earns to buy alcohol and then there is nothing for the rest of us. The children and I often go to bed with empty stomachs. 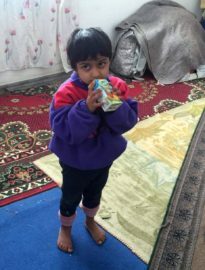 It is difficult when we wake up and the children are sick or hungry and cannot go to school or kindergarten. We always look for anything that my husband can bring us or what we can get from the church. Muajt e parë të vitit kanë qenë të ngarkuar për Bankën e Ushqimit. Në Mars, u bë shpërndarja e fundit e ushqimit për projektin e dimrit. Ky projekt u siguroi ushqim 250 familjeve për muajt e Dhjetorit, Janarit, Shkurtit e Marsit. 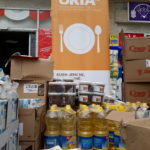 Dimri është gjithmonë koha më e vështirë për të marxhinalizuarit dhe Food Bank Albania gëzohet të mundësojë ndihmë për ta. Një grua u shpreh që ndihmën e ushqimit që merr, ajo e ndan edhe me familje të tjera afër saj. U jemi mirënjohës organizatave tona partnere që ndihmuan për identifikimin e familjeve si dhe në shpërndarjen e ushqimit. Për të mbajtur plot magazinën, banka e ushqimit ka bërë disa fushata ushqimore. Gjatë gjithë dimrit dhe pranverës ne vizituam shkollat lokale dhe u kërkuam studentëve të kontribuojnë me ushqim për nevojtarët. Kështu, gjatë javëve të fundit, ne kemi mbledhur kontributin e nxënësve nëpër Tiranë e rrethe. Njëri prej qëllimeve kryesorë është që të rinjtë shqiptarë të përfshihen në luftën kundër urisë dhe fushatat ushqimore janë mënyra më e mirë për këtë. u bë gjithashtu edhe në qytetet e Fierit, Elbasanit, Shkodrës dhe Lushnjes. Rezultati ishte rreth 2 tonë dhurata ushqimore që do të ndihmojnë bankën e ushqimit t’u sigurojë vakte të ushqyeshme gjatë verës familjeve në nevojë. 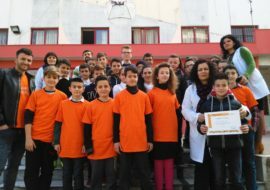 Gjithashtu, gjatë muajit Mars, banka e ushqimit filloi një Program Sponsorizimi për Fëmijët që ka për qëllim të arrijë rreth 30 familje Rome në zonën e Elbasanit. Qëllimi i projektit është t’i mbështesë ata me qëllim që fëmijët e vegjël të shkojnë në shkollë. Faleminderit kujtdo që ka ndihmuar në këto përpjekje – pa vullnetarët, ndihmën financiare dhe donacionet e ushqimit nuk do të kishte një bankë ushqimore. Koha dhe kontributet tuaja bëjnë ndryshimin në luftën kundër urisë në Shqipëri! 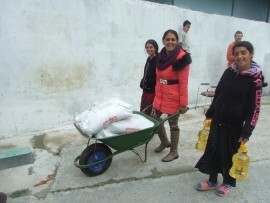 The first few months of the year have been busy for Food Bank Albania. In March, we completed the last month of food deliveries for the winter project. This project provided food to 250 families for the months of December, January, February and March. Winter is always the hardest time for food insecure families and those struggling to get by and Food Bank Albania is happy to be able to help some of those in need. A woman said that the help that she receives, she shares with other families around her. We are thankful to our partner organizations for helping to identify families and distribute food. To keep our warehouse full, the Food Bank has conducted several food drives. Throughout winter and spring we visited local schools and asked students to contribute food to help the needy. 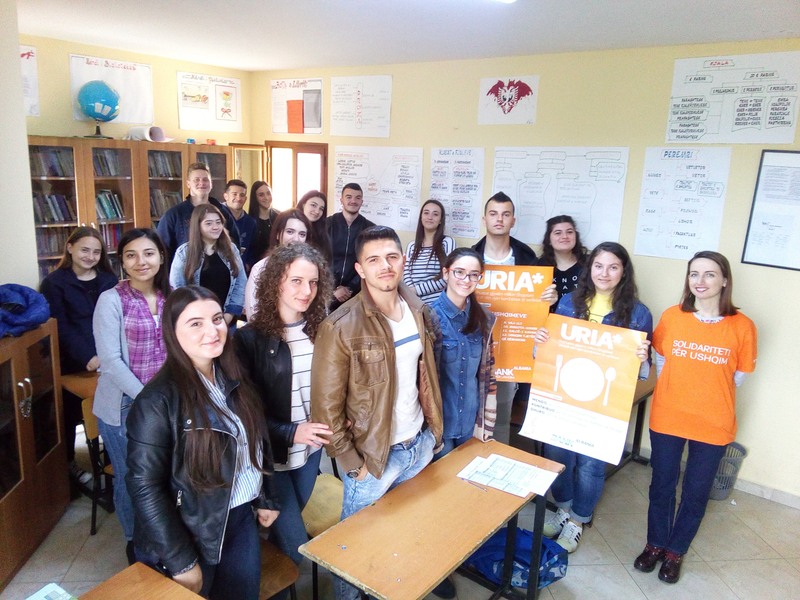 Over the last several weeks, we have been collecting the contributions of students around Tirana and other cities. One of the Food Bank’s main goals is to get Albanian youth involved in the fight against hunger and the food drives are the best way to do that. On April 9th and 10th the Food Bank conducted a community-wide food drive. 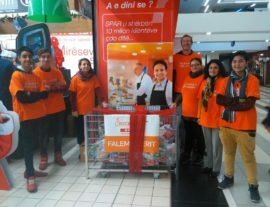 With the support of Carrefour and Eco Market, volunteers from Food Bank Albania and the Red Cross were able to collect donations at 13 points throughout Tirana. If you went shopping on either of those days you may have noticed volunteers requesting donations at your local supermarket. The campaign was also done in the cities of Fier, Elbasan, Shkodër and Lushnje. It resulted in almost 2 tons of food donations that will help the Food Bank provide needy families with nutritious meals into summer. 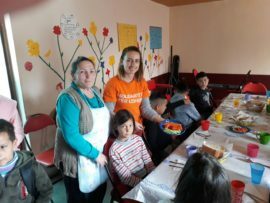 During the month of March, the Food Bank started a Child Sponsorship Programme that aims at reaching about 30 Roma families in the Elbasan area. The goal of the project is to support them so that the little children can attend school. Thank you to everyone who has helped with these efforts – without volunteers, financial support and food donations there wouldn’t be a food bank. 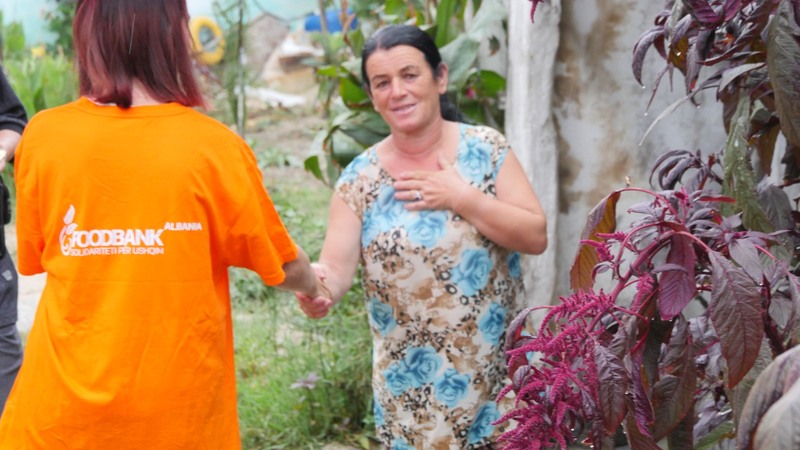 Your time and contributions are making a difference in the fight against hunger in Albania! 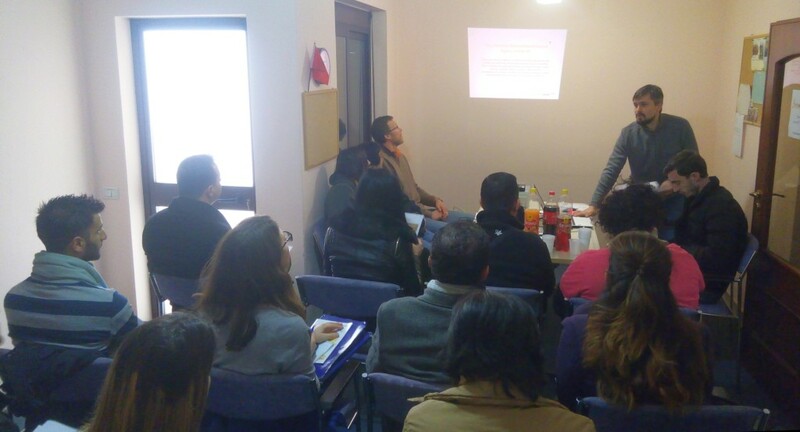 On February 11 2016, Food Bank Albania hosted a meeting for 13 distributing organizations. It was a great opportunity to get together and evaluate our current programs and the needs of the people that we serve as organizations. One of the benefits of getting together is the ability to collaborate to address our needs and identify areas where our organizations can work together. Many of the organizations are hoping to expand the number of families and individuals they can reach and would like to receive more food from the food bank. 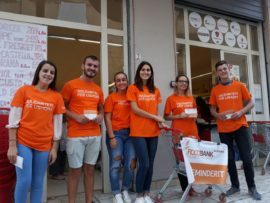 Food Bank Albania believes in this goal and believes that we can dramatically increase the amount of food we distribute by working together to provide volunteers for food drives and expanding the number of supermarket collection points that we offer. It was a good way to start the year and to meet people who are invested in the fight against poverty! At Food Bank Albania, we have ambitious goals for 2016 and with the help of our partners we are confident that we can reach even more families this year!